What’s it like to have perfect pitch? 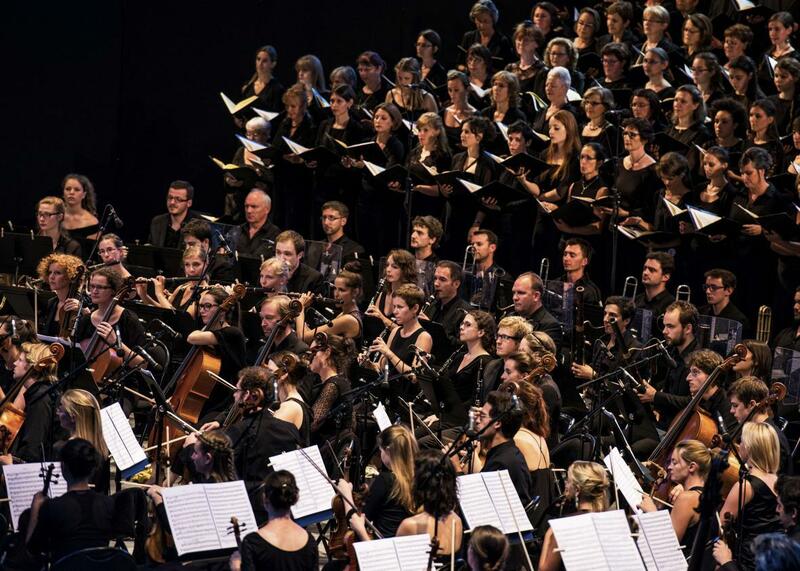 An orchestra plays the “Te Deum” composed by Hector Berlioz on Aug. 21, 2015 in Vienne, France. Imagine for a moment that your friends all see the world differently. They can see everything fine—the shapes, the shadows, the textures. The colors are there too: The sky glows blue, the leaves on trees look pretty green, and the earth is a homely brown. All is well. But wait! They look away for a moment then back at the same scene. The sky’s purple now! The trees have turned teal, and the earth’s a sickly yellow. Good thing they’re still all different colors, though, or else it’d probably be hard to see. Your friends look again and now the sky’s green, the leaves brown, and the ground blue. What in the world?! It’s like the color wheels in their heads are rotating! The world always looks resolutely normal to you, no changing color shenanigans, so sometimes your friends ask you to tell them what color the sky actually is. You say it’s blue. They’re all amazed that you know the sky is blue and you look at them funny, puzzled by how their shifting notion of color doesn’t bother them in the slightest. That’s what it’s like having perfect pitch. The world seems totally in order for me—like how you always know blue is blue, I always know D-flat is D-flat. Like how everyone else in the analogy quickly loses track of absolute coloring but can always keep the colors distinct and in order, that’s how having relative pitch but not absolute pitch (i.e., what most people have) would be like in my mind: weird! Having relative pitch but not absolute pitch seems like it’d be more difficult to develop too, yet that’s how it is. Turns out that surfaces tend to reflect the same wavelength photons all the time (i.e., stay the same color), but the physical motions give rise to vibrations in the air (i.e., sound) that have different frequencies all the time (e.g. rustles, thuds, screams). Thus, absolute color is useful, but absolute pitch? Not as much. Similarly, evolution taught us to communicate by vibrating our vocal cords and modulating pitch by stretching or relaxing them. Since pitch also varies between resonant cavities in their chests, it’s quite practical for our understanding to be flexible between absolute pitches. On the other hand, everyone always looks sorta brownish, so flexible color sensitivity is pointless unless we start communicating with biological LEDs or something. Note that colorblindness is more analogous to the loss of relative pitch, not absolute pitch; seeing green and red the same is like hearing adjacent octaves as overlapping. Anyway, aside from some humorously marginal uses for perfect pitch, perfect pitch is a key component of my musical talent, and I am grateful to have it. It enabled me to learn piano and violin starting at 4, progress quickly, and always play in tune. Combined with my muscle memory, perfect pitch also gave me exceptional musical memory. As concertmaster in high school, to know my intonation was always correct, to tune the orchestra by myself, to lead sectionals with confidence—perfect pitch was such a blessing. In my community orchestra, I met many people with perfect pitch (evidently it’s correlated with musical interest), and I learned that there are different varieties of perfect pitch. I lucked out and got instantaneous and accurate perfect pitch, so that’s cool, I guess? Unlike many people with perfect pitch, hearing out of tune music doesn’t bother me. The current 440 Hz-based scale is arbitrary, after all. The only downside is that my relative pitch is underdeveloped. I sometimes have to count out intervals when others can do it naturally, and I’m significantly worse at transposition because my sense of pitch is inflexibly anchored to the absolute scale. Hearing: What are the relative levels of perception when it comes to perfect pitch? Perfect pitch: Why is perfect pitch even a thing? Talent: What can I do with perfect pitch?